Maryland officials on Wednesday praised initial federal funding announcements for two light rail projects in the president's budget proposal, saying their inclusion puts the state in a strong position to build the projects in the Washington suburbs and the Baltimore metropolitan area. Estimated costs for both projects, however, crept higher. President Barack Obama's budget plan includes $100 million each for the Purple Line and Red Line for the fiscal year beginning Oct. 1. The projects also received recommendations from the Federal Transit Administration for $900 million each for longer term agreements. "It really puts us in such a strong position to deliver two, you know, gangbuster projects for both Montgomery and Prince George's County and the Baltimore metropolitan area,'' Maryland Transportation Secretary Jim Smith told the state's Board of Public Works on Wednesday. Congress could still adjust the $100 million in the fiscal year 2015 budget proposal. The Purple Line would run 16 miles with 21 stations between Bethesda and New Carrollton in Montgomery and Prince George's counties. It would pass through Silver Spring, Takoma Park, Langley Park, College Park and Riverdale. Maryland officials have been working on developing the Purple Line for years to help address terrible traffic congestion in Maryland around the nation's capital. The estimated cost has risen from $2.15 billion to $2.37 billion, according to a federal report released Wednesday. The additions are attributed to increased real estate costs from a larger number of land parcels to be acquired and from increased cost of site preparation. About $126 million of the added expense is due to project financing costs. 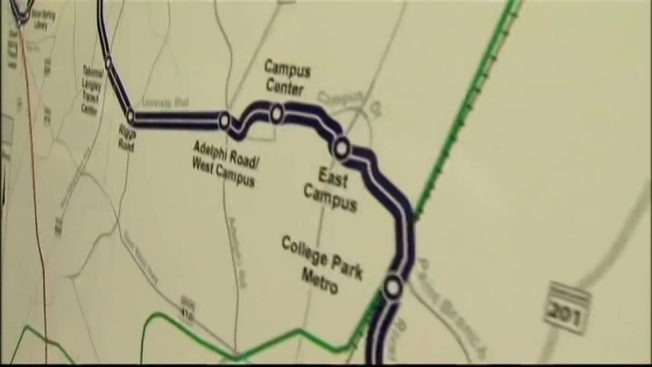 Maryland is seeking a public-private partnership to build and operate the Purple Line. Four teams are vying for the project, Smith said. The state hopes to begin construction in the spring of 2015 in hopes of completing it in 2020. An environmental study also is needed. The Red Line is an east-west public transit line in Baltimore. The estimated cost for the Red Line also has increased, from $2.57 billion to $2.64 billion, primarily due to increased construction costs for underground stations and for a heavy maintenance facility. The state hopes to begin construction in 2016. "Given the difficulties in Congress, I'm sure that there were those that had doubts as to whether both of these projects could move forward simultaneously, but this is a very, very positive signal, and hopefully our congressional delegation will be able to work to pass this budget with both of these projects still intact,'' O'Malley, a Democrat, said in an interview in Annapolis.